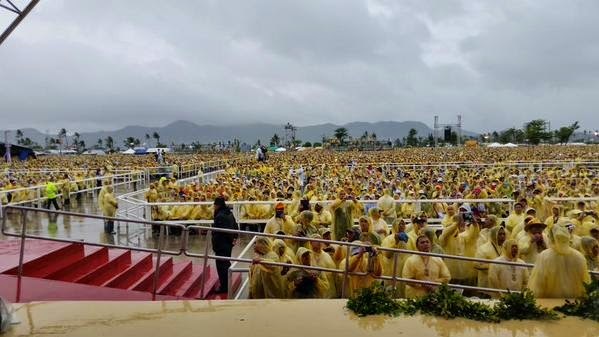 (Tacloban 9am) At least by the Pope's schedule, magandang umaga – good morning. To accomplish the purpose for which he most wanted to visit the Philippines, Lolo Kiko left Manila for Tacloban – ground zero of 2013's catastrophic Typhoon Yolanda (Haiyan) – almost an hour ahead of schedule, ostensibly in light of the tropical storm rains which have already begun to soak the islands' southern tier. Already, an announcement was made that Communion will not be distributed at this morning's Mass at the town's airport to spare the crowd's time spent outdoors. With a focus on "human ecology" and climate change likely to figure in today's message, texts to drop on delivery. Til then, the liturgical texts are available via the e-book Missal for this weekend's trip. The Consistory... Starring "The Peripheries"